The Wailing Wall, a portion of the original wall of the temple, where Jewish people pray (and weep) over their broken land. Two young Jewish men praying at the wall. 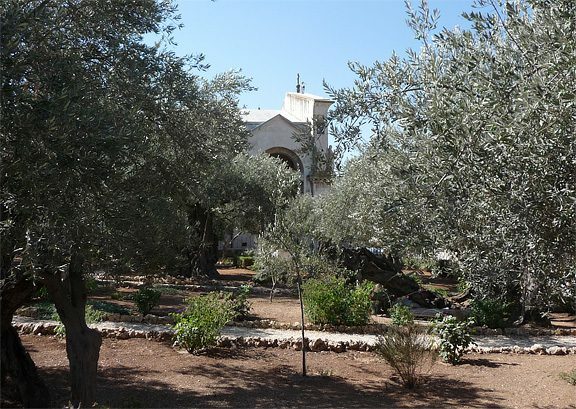 Olive trees in the Garden of Gethsemane. Notice the unusually large size of the bottom of the trunks. This shows that these trees are ancient. 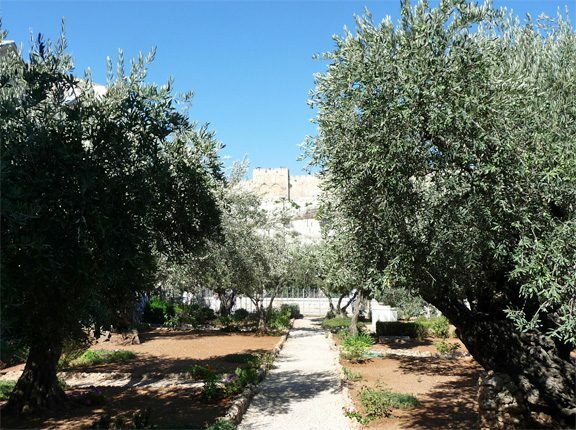 The Garden of Gethsemane in the foreground, with the Golden Gate of Jerusalem in the background. The Garden of Gethsemane in the foreground; the Church of All Nations in the background. 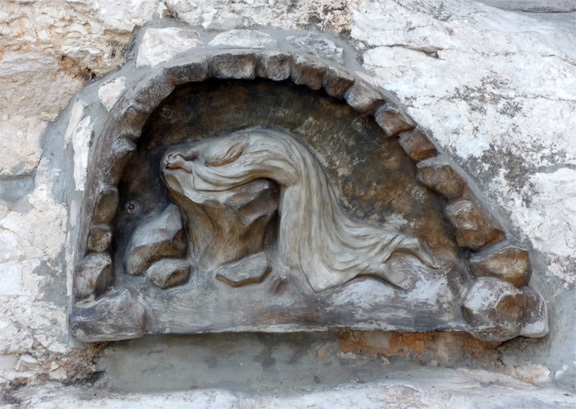 Small sculpture of Jesus praying in the Garden of Gethsemane. In the wall of the garden near the Church of All Nations. 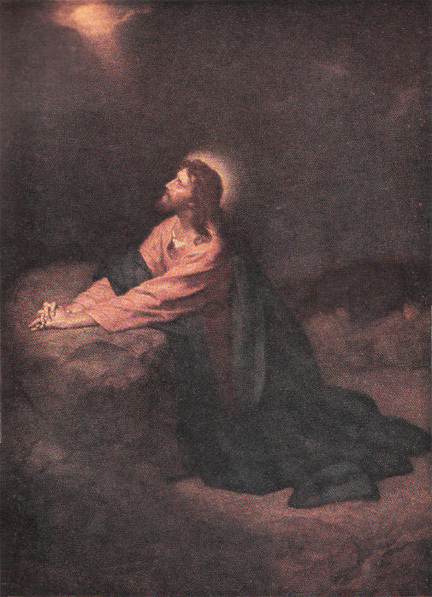 Heinrich Hofmann's influential painting of "Christ in Gethsemane." 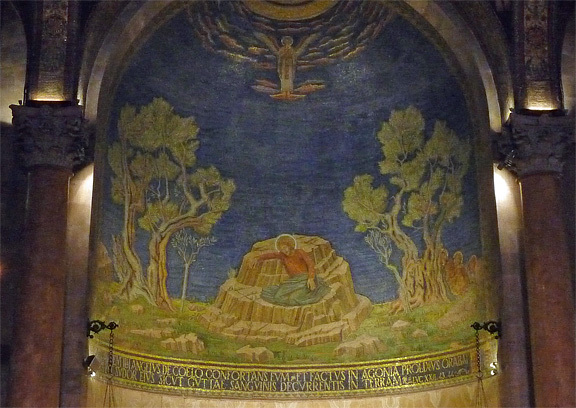 The original is in the Riverside Church in New York City. Image obtained from WikiCommons. The following three photos focus on a beautiful church in Jerusalem, the Church of St. Peter in Gallicantu. “Gallicantu” comes from the Latin meaning “rooster crow.” The church remembers Peter’s denial of Jesus, and is in a location that may be very close to where the actual denials occurred. The exterion of the church of St. Peter in Gallicantu. This photo with permission of HolyLandPhotos.org. The interior of the Church of St. Peter in Gallicantu. The group in the foreground was from Africa. 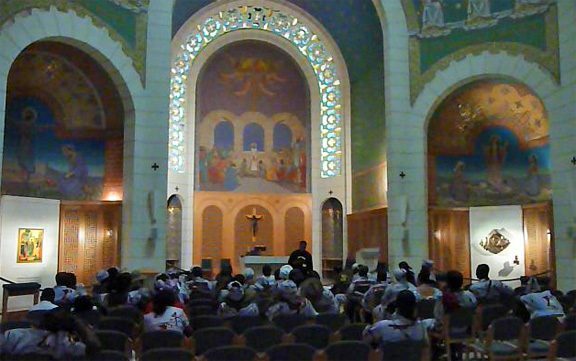 They were singing in their native tongue, filling the sanctuary with heavenly music. 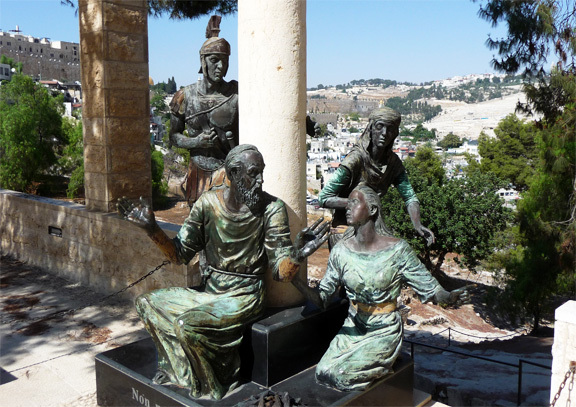 A statue of Peter denying Christ. From just outside the Church of St. Peter in Gallicantu. In the background you can see the wall of the Temple (left) and the Mt. of Olives (right). 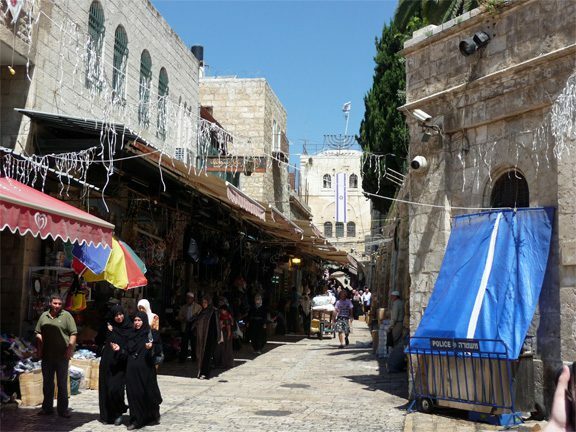 The Via Dolorosa (Way of Suffering or Way of the Cross) in Jerusalem snakes through the Old City, beginning in the Muslim Quarter. Millions of Christians walk along this path, which is believed to be the way Jesus walked as he carried his cross. It is in some ways one of the holiest places in the world for Christians. At the same time, the Via Dolorosa is filled with businesses and people whose business is anything but remembering Jesus and his death. 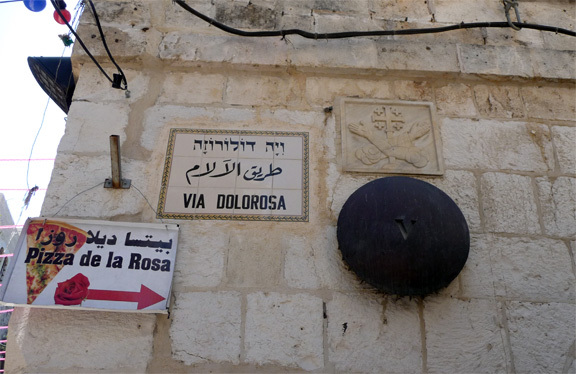 A portion of the Via Dolorosa, on the way to Station V and the Chapel of Simon the Cyrene. 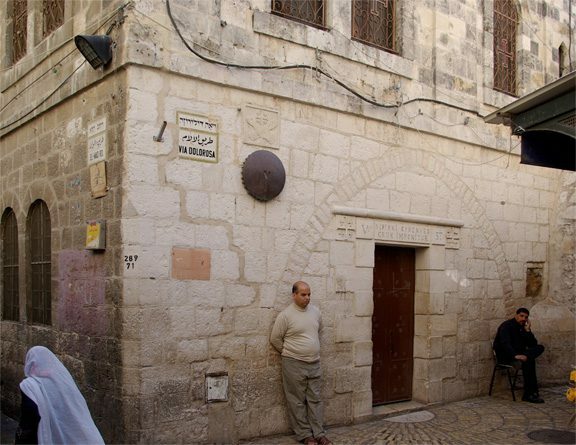 Outside of the Chapel of Simon the Cyrene, Station V of the Via Dolorosa. When I was at Station V, I was at first distressed to see the "Pizza del la Rosa" sign, which advertised an Arab pizza place right down the street. But, as I thought about it, I decided this pizza sign is a good reminder that Jesus came into the real world, not some sanitized spiritual reality. Without a doubt, Jesus was crucified and buried just outside of the city of Jerusalem (John 19:20; Hebrews 13:12). 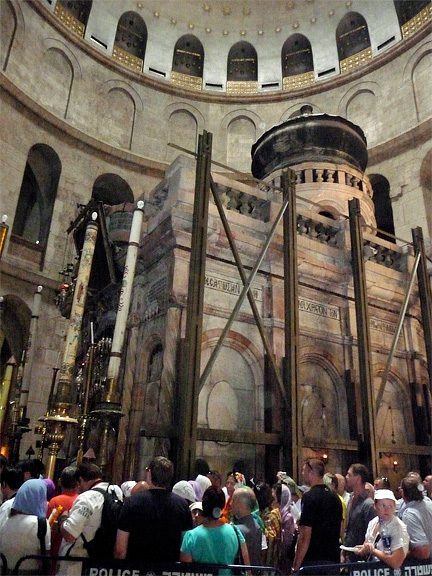 Nobody knows for sure the exact locations of the crucifixion and burial, though ancient Christian tradition locates these events in a place that is now contained within the Church of the Holy Sepulchre in Jerusalem. 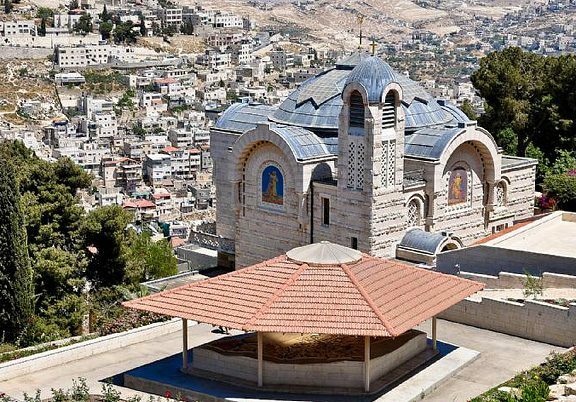 Catholic, Orthodox, and Armenian Christians are convinced that this is the place where Jesus was crucified and buried, and their evidence is solid. Many Protestants have not accepted this traditional location, however. In the late 19th century, Major General Charles Gordon discovered another place that seemed to him to be the true location of Jesus’ death and burial. For one thing, it featured a hill that looks rather like a skull. 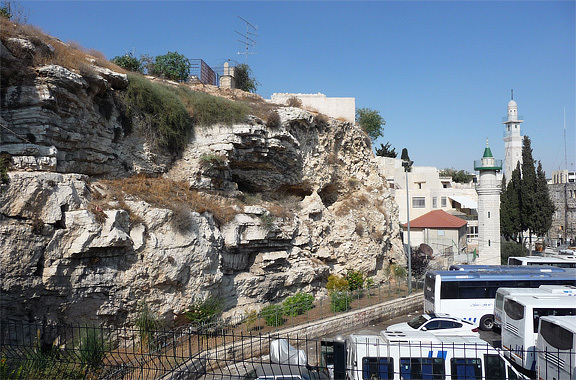 As you may recall, Jesus was crucified on Golgotha, which means “place of the skull.” Moreover, not far from this hill, there was a garden with an ancient tomb. 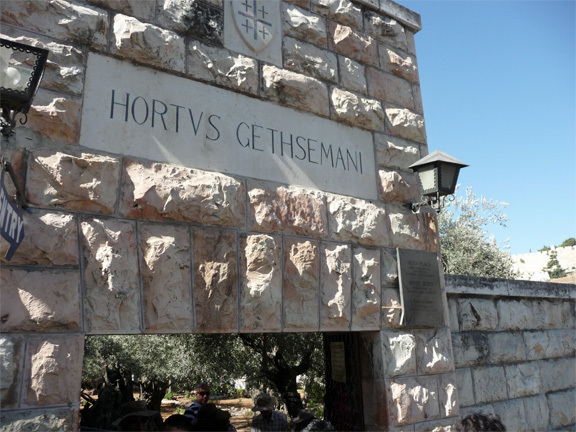 In time, Gordon’s Calvary and the Garden Tomb became popular among Protestant tourists and pilgrims, who believed them to be the actual places of Jesus’ crucifixion and burial. 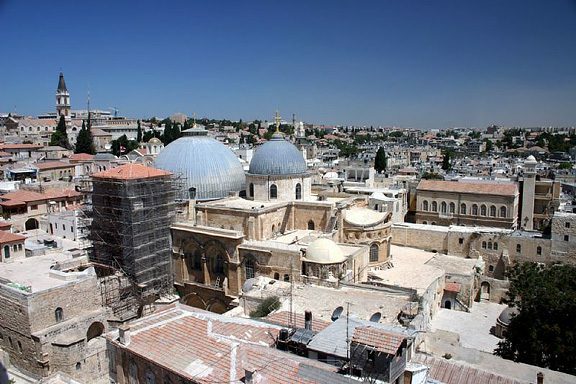 Though I don’t believe we will ever have definitive proof of the location of these key events, the historical evidence does favor the Church of the Holy Sepulchre. 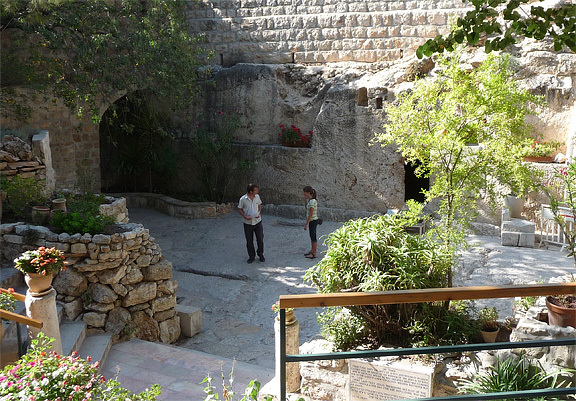 However, a visit to the Garden Tomb is wonderful, no matter the history, because it is a place of unusual quiet and beauty just outside the walls of Jerusalem. The Church of the Holy Sepulchre. Photo used by permission of holylandphotos.org. The so-called "Greek Calvary" in the Church of the Holy Sepulchre. 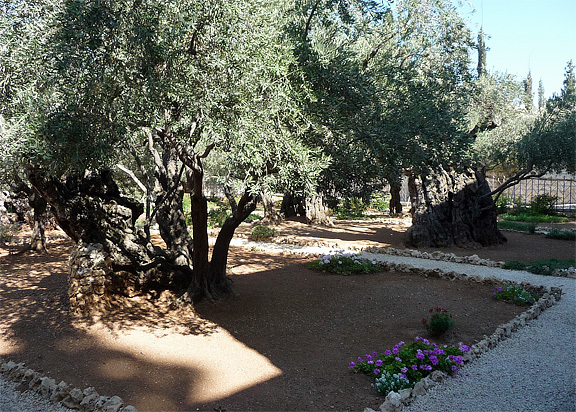 Many believe that this is the exact location of the crucifixion of Jesus. 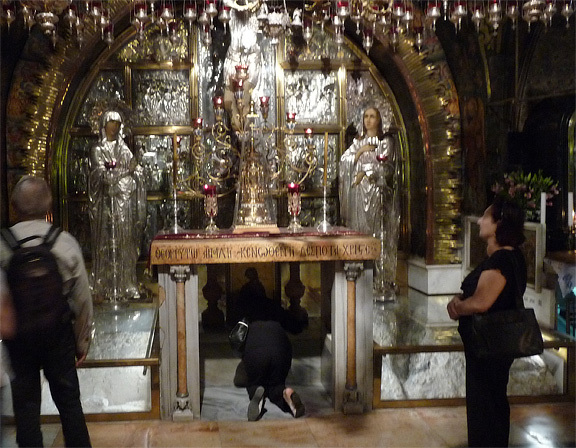 Beneath the altar, there is a place where pilgrims can touch that actual stone of Golgotha. 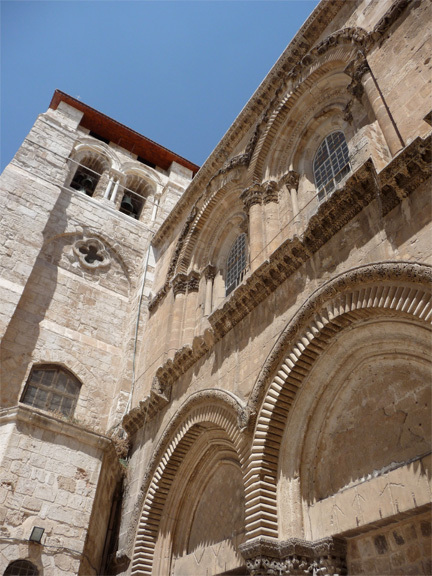 Within the Church of the Holy Sepulchre, there is a chapel that is believed to contain the tomb of Jesus. 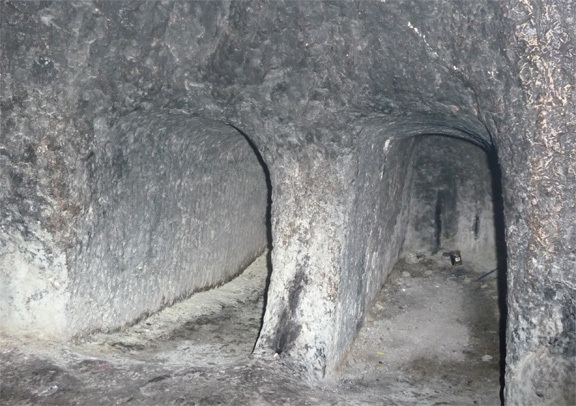 Not far from the tomb of Jesus, there are other tombs carved into the rock. The tomb of Jesus looked very much like one of these. You an see why some people think this is Golgotha, given the skull-like appearance fo the rock. Today, is is right next to a bus station. My daughter talks to the guide near the Garden Tomb. You can see the tomb just to the right of my daughter.